These 10 Mysterious Jaw Dropping Facts About Puri Jagannath Temple Will Leave You In Shock! Indian temples are full of mysteries and astonishing tales. Multiple stories behind the establishment of temples are adopted and made into movies which even garnered various awards. Now, when it comes to the facts about few temples, the reality is nothing far away from the stories. Personal experiences in such temples are quite beyond explanation, this kind of places picturized India as the spiritual country in front of the foreigners. However, there are certain things which every common pair of eyes can encounter during the visit. One such kind of place with the wondering visual odds is Puri Jagannath temple in Puri, Orissa. The temple is well known for its avid architecture, patterns and rich cultural heritage. 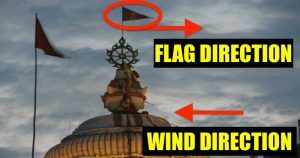 It is well known that anything moves in according with the direction of air, but, in this case, the direction of the flag on the top of the temple is quite opposite. The Neela Chakra at the top of the temple is visible from any part of the city of Puri, and surprisingly you will find the Chakra facing you from any place. The movement of the breeze, in general, is from sea to land in the daytime and vice versa in the evening. Meanwhile, in Puri, it is observed to be just the reverse. Birds generally fly around the apex of the temple. Aeroplanes are indeed restricted to do so, but more astonishing is the fact that even birds do not fly above the Puri Jagannath temple. Whatever the object might be, the monument might be, shadows are something that exists for every solid particle, now when it comes to the Puri Jagannath temple, the dome of the temple doesn’t carry a shadow. On the other side, people says that the shadow of the dome is invisible. This temple has one doorway or Singha Dwaara beyond which you cannot hear the sound of the sea waves. When you cross over to the other side it is just not audible. According to the mythology or the history of the temple, it is believed that the Subhadra Maharani, the sister of the two Lords wished peace and tranquillity within the temple abode and giving in to her wish it was made to happen that way. The Prasad or holy offering to the Lord is cooked on firewood in seven vessels kept one above the other. The miracle is that the food kept in the topmost vessel gets cooked first, followed by the second and so on till the seventh or lowest one above the fire gets cooked. There might be some science behind this, however, this never happens in any other temples. Surprisingly, the quantity of Mahaprasad cooked inside the Temple remains the same for the entire year. But that same quantity of prasad can feed few thousand people to a few lakh of people, there has never been a shortfall. Two distinctive chariots are used to carry the deities during the Chariot Festival at Puri. Since there was a river flowing in between the Sri Mandira (Jagannatha Temple) and Mausi Maa (Aunty) temple, the first set of chariots used to bring the lords till the river, then the lords had to ferry across the river in three giant wooden boats and were then placed in the second set of chariots to reach the Mausi Maa temple. During the chariot festival, there is a spot just ahead of the Gundicha Temple where the entire procession comes to a halt on its own. This is a mystery since despite the unwritten rule that the temple doors are closed to the public after 6 P.M. and elaborate planning by the organisers the proceedings have delayed beyond this time in every Yatra. However, this also gives the opportunity for the throngs of devotees to actually come and touch the idols which otherwise would not be possible in the precincts of the temple.